The term hypertext has been used for the past three decades to extend the functionality of the traditional form of linear text. Something that follows a sequential path is called linear like a book which is usually read from the beginning to the end thus following a sequential order. Advances in technology and the evolution of internet, however, have allowed programmers to develop much sophisticated ways to read traditional text such as hypertext. It simply allows cross indexed content or information to be embedded within chinks of text as references which would enable the reader to move from one location to another within the same or another document. Hypermedia is a superset of hypertext used in a much broader sense and is not constrained to be text-based. The two are relative terms but used in different contexts when it comes to multimedia applications. Hypertext is a powerful cross-referencing tool meant for user-driven access to an ocean wealth of interconnected information either static or dynamic in an electronic format. 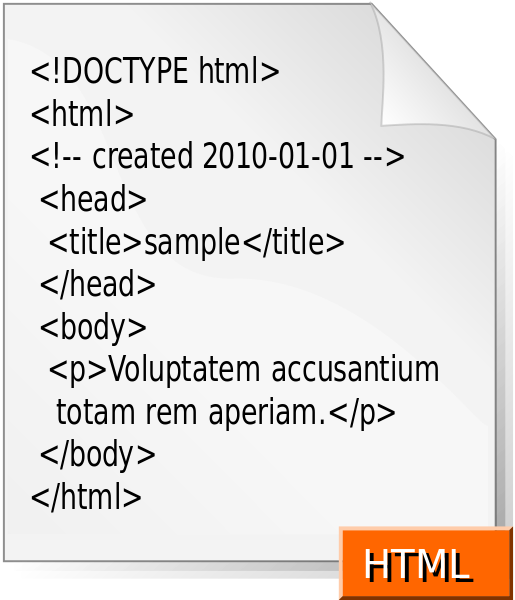 Simply put, hypertext may refer to plain simple text that contains links to access other chunks of text within the same or different document. It provides a means to organize and present information in a way that is easily accessible to the end users. It’s more like a user-driven tool to represent textual information which are linked together to provide more flexibility and a greater degree of control. This allows users or readers to move from one location to another via hyperlinks or “go to” links. Links connect nodes to other documents and are usually activated when clicked upon by a mouse or other pointing device. Hypermedia is an extension of hypertext that employs multiple forms of media such as text, graphics, audio or video sequences, still or moving graphics, etc. The structure of hypermedia is quite similar to that of a hypertext, except it’s not constrained to be just text-based. It extends the capabilities of hypertext systems by creating clickable links within web pages to create a network of interconnected non-linear information which user can both access and interact with for a better multimedia experience. 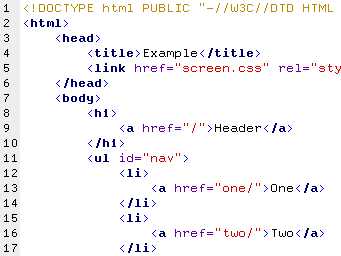 The most common hypermedia type is image links which are often linked to other web pages. It is used in a variety of applications from problem solving and qualitative research to electronic studying and sophisticated learning. Hypertext simply refers to text that contains links to other chunks of text to which the user is transferred to usually by a mouse click or keypress. The documents are linked together via hyperlinks which allow users to jump from one document to another within the same or different web pages. Hypermedia, on the other hand, is an extension of the term hypertext used in a similar way except it’s not constrained to text elements. In fact, hypermedia contains different media elements or morphologies such as audio, images, video, and still or moving graphics. Hypertext is an interconnected network of documents and other media referenced through links between them. It can contain either static or dynamic content in an electronic format. The static content is the content that can be delivered directly to the end users without any modification whereas dynamic content may subject to change based on user inputs. Hypermedia is the next level of multimedia experience which extends the notion of hypertext links to include not only text but a wide range of other multimedia elements such as audio, video, and graphics. Although the term hypertext is widely used in association with the World Wide Web, the technology has been around since ages. The hypertext technology is solely based on human-computer interaction by strong cross referencing tools called hyperlinks. It facilitates effective use of text and links and how to implement it on the World Wide Web. Hypermedia technology is based on non-linear forms of media which include not only plain text but also other multimedia elements to enhance your overall multimedia experience. Hypermedia technology is a major breakthrough in the field of education. Hypertext technology goes beyond the usual clicking and accessing “go to” links from one location to another on the internet. The hypertext model can be implemented on a wide range of applications and the degree of dynamic linking in the hypertext is not just limited to the internet. In fact, it can be applied to electronic studying, literary exploration, and qualitative research. Hypermedia application can be defined as a network of interconnected documents that are linked together by extensive cross-referencing tools such as hypertext. The best example of hypermedia is the World Wide Web. Both the terms hypertext and hypermedia follow a similar structure comprising of nodes that are interconnected by links except in hypermedia systems, the nodes can contain multiple forms of media such as text, images, audio, video, and graphics. The main difference lies in the way they are implemented. Hypertext is used to represent multimedia content in electronic text format whereas hypermedia combines both hypertext and multimedia to provide access to a wealth of information usually in a non-linear sequence. The idea of hypermedia is to extend the functionality of multimedia elements to make content more interactive and better accessible than before. The whole idea of the World Wide Web is based on the concept of hypertext and hypermedia. Sagar Khillar. 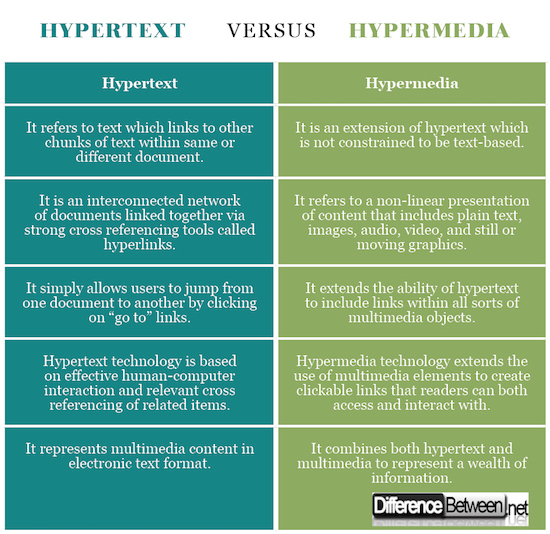 "Difference Between Hypertext and Hypermedia." DifferenceBetween.net. May 17, 2018 < http://www.differencebetween.net/technology/difference-between-hypertext-and-hypermedia/ >.